Welcome to the STAR group page! STAR stands for School Travel Action Representatives. 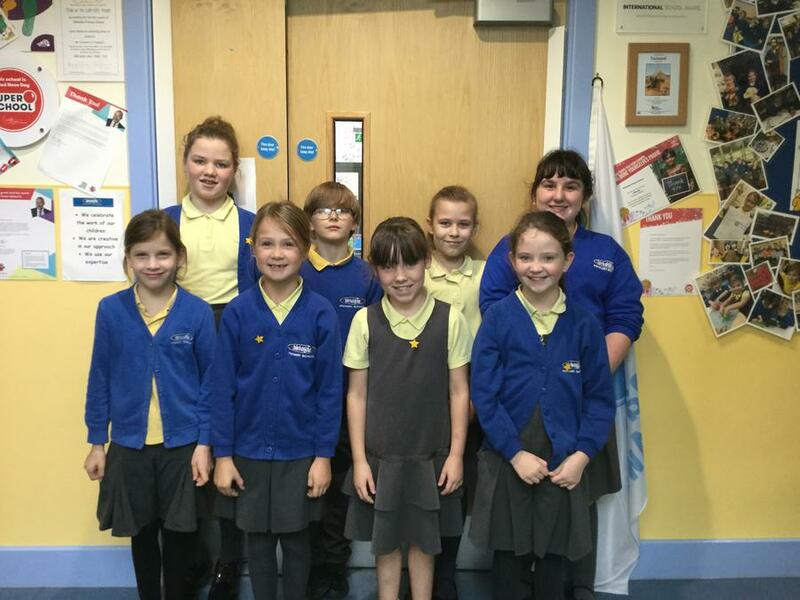 We meet regularly and discuss issues around travelling to school. We also have a STAR noticeboard in the hall which is used to display photographs of STAR group events and reminds everyone about how we can travel to school in a healthy, sustainable and safe way. The yellow stars contain messages about travelling to school and how to be a good friend to others. The STAR group is made up of one class representative from each of the Junior classes. Our first project is 'FRIENDSHIP WEEK' and this will be held at the end of November. We will be making posters to put up around our school to remind everyone about how important it is to look out for and look after our friends. The STAR group will design and produce a leaflet to promote this event.....which aims to promote walking to school, scooting to school and parking away and walking to school. We now have some fantastic news to announce! Each class had a STAR wallchart to record their class numbers achieving these healthy and environmentally friendly ways of travelling to school every Wednesday and a Wheelie,Walkie Wednesday Trophy was awarded each week in assembly for the class with the highest percentage travelling to school in a sustainable way....and then hopefully the good habits will now be continued for the other weeks of the year too! Look out for our 'BIKE IT BREAKFAST' events in the Summer Term. Breakfast will be served in the hall and will include toast, muffins, crumpets, yoghurt and fruit.....along with water, milk, fruit juice and milkshake. All our Year 2 children, and some children from the Junior classes have been involved in 'Learn to Ride' sessions led by Amanda Dufresne from SUSTRANS. We would like to thank Amanda for her support and encouragement. We have held regular 'Walk to School', 'Bling Your Bike' and 'Bike It Breakfast' events and had a fantastic 'Silly Socks Day' as well as 'Walk to School with a Friend Day'. A SILVER AWARD 'BIKE IT' SCHOOL! This award is for us all! 'Well done' to everyone for all the activities we do here at Birkdale Primary School to promote safe cycling, scootering, considerate parking, parking away and.......... walking to school.